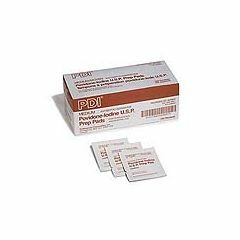 PDI Povidone Iodine Prep Pad - Medium, 1 3/16" x 2 5/8"
use them for personal use and they are so easy to carry. STERILE. Lightweight. Easy Storage. Safe. Lightweight. Easy Storage. Perfect Product. Perfect Size. by Jess from Riverside, Calif.
Is there a discount if bought by the case? Can I buy povidone iodine pads in a case or only box qty?